Gun-control expert (and drug-crazed acid rocker) Ozzy Osbourne made this comment about guns, "I keep hearing this [expletive] thing that guns don't kill people, but people kill people. If that's the case, why do we give people guns when they go to war? Why not just send the people?" VCDL member Chris Richardson's response: "Why don't we just send GUNS, Ozzy?" The very erudite and loquacious anti-gun Mayor of Chicago, Richard Daley, said, "Guns [sic] Is Not the Answer" to self-defense. VCDL member Steve Layman's response: "Perhaps Mayor Daley can take the lead and go without his taxpayer funded, armed security that protects him 24/7 (with guns)." If you attempt to make guns on your own, thinking the new Firearms Freedom Act protects you from federal meddling, you will be arrested, convicted, and hurt the nation beyond anything you can imagine. I'm still hearing from people who think the law allows them to go into the gun-making business. WRONG!! Cease and desist immediately if you have started tooling up. FFA is not a commerce or jobs bill, at least not yet. It is a carefully planned legal challenge, on 10th Amendment grounds, against the federal government, coordinated amongst many states. No one should think of it, or act on it, as if they are now free to manufacture firearms without federal control. That point may never even be reached, depending on how the legal challenge goes. It will likely be a year or more before the issue is settled. "The new Arizona law (other states have enacted it too, Montana was the originator) will have little immediate effect on the average gun owner. The bill's proponents strongly advise AGAINST opening up your own gun-making shop in your basement, believing yourself free of federal constraints. Without a carefully structured case, strong legal team, complex strategy and significant financial backing, the feds will crush such a 'wildcat' attempt, imprison the entrepreneur and set precedent that will empower themselves at the expense of the nation at large." Do you ever leave your state? 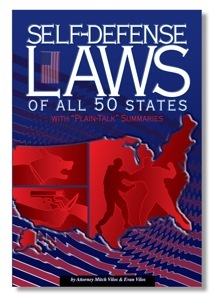 Self-Defense Laws of the 50 States! in more trouble than an attacker? Just look at the Table of Contents. 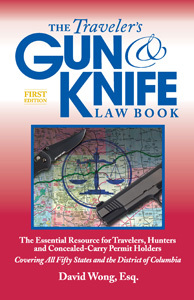 Brand new and five times thicker than the original Traveler's Guide, this covers guns AND knives, restaurant carry, park carry, your rights in a traffic stop, do you have to notify officers, much more, with tremendous detail you could not get before! The Court has not been quiet on this subject -- they used some form of the word gun 2,900 times in 92 cases (rifle, shotgun, pistol, Winchester, etc.) and the decisions are consistent with an individual right to arms. Some of the plain-English case summaries read like novels -- cowboy shootouts, hotel brawls, ambushes, cattle rustlers, corrupt sheriffs, even a mutiny, including 14 self-defense cases with the Court defending the rights of the innocent to shoot aggressors. National Training Week, widely endorsed, is the time when Americans everywhere are encouraged to go to a range and exercise their right to keep and bear arms. YOU help make this happen, by encouraging your friends and family to go out and burn some powder with you. Dust off that old hog's leg and fire it up. Take someone you know who has never fired a gun to the range for a good time -- you know how much fun they have, and it helps build support for our rights. 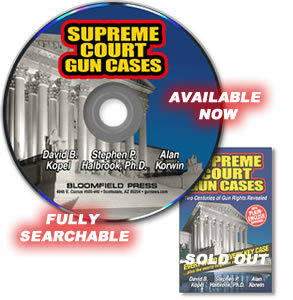 The big headline in the U.S. Supreme Court's McDonald v. Chicago gun-ban-case decision, handed down on June 28, 2010, is that the individual states are now bound by the Second Amendment. Previously, only the federal government was technically bound. The right to keep and bear arms is "incorporated" under the 14th Amendment and applies to the states, under the Due Process clause used to apply other BOR requirements to the states. For publicity, bragging rights, moral and many legal purposes, this is a big win. And it is a win, despite some negativity floating around. The alternative -- no gun-rights protection at the state level, which was avoided by just a single vote -- would have been an unmitigated disaster. Everyone now has a claim to constitutional gun-rights protection instead of none, which is what four of the nine Justices would have given you. Exactly how bound the states are though is unknown, and will be the subject of endless debate and future court actions. No standard of review for acceptable laws is provided, although the extremely low and virtually meaningless standard of "interest balancing" that Breyer would like to see is off the table. The decision is emphatic on the point. One pundit says this is virtually "strict scrutiny," the highest standard possible, though that's a bit overstated. Attorney Nick Dranias at the Goldwater Institute told me he considers this the strongest part of the decision: "its embrace of the statement in Heller that the scope of the right to bear arms will be determined strictly by its original meaning and not by judicial balancing tests. This is something that the Court has not even said with respect to the right to free speech. The court is getting it right from the inception and may be able to avoid decades of meandering that the balancing tests in First Amendment jurisprudence forced. The court's complete disavowal of balancing tests is huge." This does however still leave legislatures and lower courts to act independently, and seek further SCOTUS clarification in the years to come, but that's to be expected, and throws us back to the need for eternal vigilance. But the decision does give the pro-rights forces a Superman-strong leg up at the bargaining table. The very troubling sub-head of the story is that Chicago apparently will be free to act like Washington, D.C. did after Heller. Chicago's law died, in effect, two years ago when the D.C. law died, and their response will be similar. Chicago under mayor Daley will do everything it can -- including maneuvers that will be totally rejected later as unconstitutional -- to keep its people repressed and deny, as fully as possible, the right to own, have and use guns for personal defense and other lawful purposes. The mayor has said as much (noted at the end of this article, along with other antis and news media gaffs). We on the pro-rights side of the aisle had hoped for "reversed," meaning the 7th Circuit decision saying we had no rights would be overturned. And we got it, hallelujah, but with the predictable "and remanded," meaning the 7th Circuit will get another crack at the law, and must do something to make it acceptable. If precedent is any gauge, they'll do as little as they can, leave Chicago dangerously unfettered, make the public hopelessly fettered, and instigate more lawsuits and endless wrestling with our rights. Hey, more lawsuits are just job security for lawyers -- a pretty slick conflict of interest. Contrary to some exuberant reports, the people of Chicago do not have their right to keep and bear arms restored. All they have is that this onerous near-total ban goes too far. And that, my friends, is disastrously troubling. Just how far can "authorities" go in infringing your rights, before they've gone too far? Nothing in this decision apparently comes anywhere near "shall not be infringed," a phrase that is used a few times as a reference -- but never as a tenet of the holding. It is all but ignored as the meaning of the Second Amendment. In its place is the assumption that only so much regulation is tolerable, a dangerous and moving target. The Court clearly set the baseline for us, several times, repeating the decision in Heller: "...the Second Amendment protects the right to possess a handgun in the home for the purpose of self-defense." This is established as a core purpose of the Amendment -- not the only one, but for now, a threshold below which no statute can go. Fortunately, the decision does recognize what many of us would put as the true core of the Amendment, the "palladium of liberty" idea (which is fortunately referenced several times) that "the right of the citizens to keep and bear arms... offers a strong moral check against the usurpation and arbitrary power of rulers; and will generally, even if these are successful in the first instance, enable the people to resist and triumph over them" (quoting Justice Story from 1833). Skeptics who have come out insisting they will not celebrate this ruling have a point too horrifying to think about. This is the first step down the road to "official" licensing, registration, list making, and condition demanding that every level of government down to the tiniest bureaucrats will insist upon, to "allow" you to have some kind of firearm, locked up and safe in your home. Yes, Heller ruled out keeping arms so locked up that they're totally useless, but didn't stipulate much past that. The antis are already shifting their position to the question of how much regulation is allowed. They have craftily "conceded" that the extremes are now gone -- they can't get a complete total ban, much as they would like to, and the pro-rights people can't have anything anytime anywhere, something that was never in fact sought. Why let facts interfere with a good argument. In D.C., with a similar overturned law and a similar stipulation to fix it, they've done everything possible to ignore even that, and we can only wish the Heller decision and McDonald did more to constrain them, let alone read them the riot act. Gun uselessness is off the table but remains what too many authorities crave, and will press for. They should be indicted for trying -- as denial of civil rights under color of law (q.v., 18 USC §241 et seq.). It's past time to dust of those fine laws that put officials in prison as common criminals for denying or attempting to deny people their rights. Google that law and read it, you'll like it. Some of you state folks should introduce a local version, since the feds won't enforce it against themselves anytime soon. Because the High Court slices its baloney very thin, you clearly will be able to legally keep handguns for self defense at home. The right to keep and bear anything else anywhere else is not addressed. Getting everything else formally back into the picture (outdoor carry, firearm types, acceptable uses, commercial activity, much more) will take many moons. This extraordinarily event-filled day at the Court included Justice Stevens' last day in public as a member, Justice Ginsburg's husband's death the night before, the beginning of senate confirmation hearings for liberal High Court candidate Elena Kagan, and the much awaited McDonald decision, on this the last day of the current session. Although some people had held out hope that Sotomayor, in her first gun case, would lean on her known respect for civil rights and find for the right to keep and bear, she turned out to be the disappointment most expected, and voted for denial of rights in the 5-4 squeaker decision. She joined Breyer's dissent, a masterpiece of odd reasoning and lack of appreciation for this fundamental right. Kagan, cut from similar cloth, is likely to respond similarly if confirmed. The McDonald v. Chicago decision is a 214-page document, with a six-page syllabus (the summary that precedes decisions), a 45-page decision of the Court written by Justice Alito (which is all that's covered below, given the amount of time this took), a 15-page concurrence by Scalia, a separate 56-page concurrence by Thomas, and two dissents -- 57 pages from Stevens, and 31 pages from Breyer with a four-page appendix (joined by Ginsburg and Sotomayor). That's a lot of reading (116 pages of "you have rights," 92 pages of "you should not"), and by the time you see this, news organizations will have moved on to other subjects, but I will have just finished figuring out what the Court actually said. In the interest of speed, here's Alito's portion, and I'll get to the concurrences and dissents soon. Because I worked very fast (or perhaps, because I read very slowly, I have to pore over this stuff with a marker and examine and ponder every piece) you may find a slightly elevated error rate from my usually squeaky clean style. Please forgive me, and as usual, corrections will be forthcoming as needed. The decision is remarkably well structured and addresses each key issue one at a time. It begins with a lengthy justification for its reasoning. The Court notes the petitioners (the pro-rights side led by Alan Gura) rest the bulk of their case on the 14th Amendment's "privileges or immunities" clause. This broad protection of rights, 137 years old, was gutted completely by the Slaughterhouse cases in 1873, and petitioners point out convincingly that no modern scholar seriously argues that Slaughterhouse was correctly decided, and ask that P or I be reinstated. The High Court flatly rejects this and leaves P or I a dead letter. They showed disdain for it in oral arguments, and demolish the notion here. As a second thought, petitioners suggested the Second Amendment could also be incorporated against state infringement through the 14th Amendment's "due process" clause, which is how all other BOR provisions have been adopted. To this, the Court agrees, and it is on this point that the right to keep and bear arms won the day. The NRA in large measure championed this winning approach, over the harshly dismissed P or I stratagem. As a sidelight, the Court notes that at this point in time, all the rights of the first eight amendments have been fully incorporated except: (in addition to the right to keep and bear arms) "the Sixth Amendment right to a unanimous jury verdict... the Third Amendment's protection against quartering of soldiers... the Fifth Amendment's grand jury indictment requirement... the Seventh Amendment right to a jury trial in civil cases... and the Eighth Amendment's prohibition on excessive fines," and then provides good detail on why this is so. The purpose of the 14th Amendment is critical to understanding the incorporation process, and even more so, its role in protecting the right to arms for blacks who were being violently disarmed after the Civil War. The fight against racism, the effort to establish equal justice, the need for anyone in the south to be protected from racist former-confederate abuses, the value of arms to oppressed masses, these were driving forces behind adoption of the 14th, and that record is now indisputably out in the open. Denials, at least rational ones, will have to cease. "Every man... should have the right to bear arms for the defense of himself and family and his homestead. And if the cabin door of the freedman is broken open and the intruder enters for purposes as vile as were known to slavery, then should a well-loaded musket be in the hand of the occupant to send the polluted wretch to another world, where his wretchedness will forever remain complete." "These state constitutional protections often reflected a lack of law enforcement in many sections of the country. In the frontier towns that did not have an effective police force, law enforcement often could not pursue criminals beyond the town borders... Settlers in the West and elsewhere, therefore, were left to "repel force by force when the intervention of society... [was] too late to prevent an injury." The decision then moves to excoriate the respondents -- Chicago and Oak Park, who sought to deny McDonald's (and everyone's) right to defend themselves with a firearm. The Court shows them no mercy, in large measure because their arguments are bogus, invented, specious and without value. One by one they demolish the balderdash Chicago used to justify its position. The one I liked the most was Chicago's suggestion that "if it is possible to imagine any civilized legal system that does not recognize a particular right, then the Due Process Clause does not make that right binding on the States." "Therefore, the municipal respondents continue, because such countries as England, Canada, Australia, Japan, Denmark, Finland, Luxembourg, and New Zealand either ban or severely limit handgun ownership it must follow that no right to possess such weapons is protected by the Fourteenth Amendment." The Court virtually ridicules the suggestion, calling it "stunning," pointing out that if this were a standard for the U.S., "For example, many of the rights that our Bill of Rights provides for persons accused of criminal offenses are virtually unique to this country. If our understanding of the right to a jury trial, the right against self-incrimination, and the right to counsel were necessary attributes of any civilized country, it would follow that the United States is the only civilized Nation in the world." The one place where I believe respondents have a point, echoed by some gun-rights enthusiasts, is that incorporation weakens federalism, and to this I have some sympathy. Incorporation does limit states' ability to act, experimentation and variety, but this is an old argument as the Court notes, has never deterred incorporation of fundamental rights, and is an unavoidable side effect of ensuring that states don't abuse their residents. Where gun-rights activists will get the most stress is the Court's assurance, repeated from Heller, that this case will not eliminate "longstanding regulatory measures [such] as 'prohibitions on the possession of firearms by felons and the mentally ill,' 'laws forbidding the carrying of firearms in sensitive places such as schools and government buildings, or laws imposing conditions and qualifications on the commercial sale of arms.' We repeat those assurances here. Despite municipal respondents' doomsday proclamations, incorporation does not imperil every law regulating firearms." On the other side of the coin, however, how many laws does it sanction? No one knows. In closing, Alito first dismisses Stevens' dissent with a wave of his hand, saying Stevens' "eloquent opinion covers ground already addressed, and therefore little need be added in response." Well, he does give the guy a few paragraphs of iron rebuttal. Breyer's dissent has essentially four arguments, and Alito takes them apart in order. First, "there is no popular consensus" that 2A is fundamental, but that falls under the overwhelming evidence, and the consensus of 251 representatives and 58 senators who filed a brief supporting incorporation (plus, consensus has never been a factor). The argument that incorporation affects federalism has already been disposed of and is not grounds to deny action. Again, this does have a troubling aspect, but as the Court points out, "Incorporation always restricts experimentation and local variations, but that has not stopped the Court from incorporating virtually every other provision of the Bill of Rights. The enshrinement of constitutional rights necessarily takes certain policy choices off the table." The idea that the right doesn't protect minorities "and those lacking political clout" is easily dismissed, especially since 80% of murder victims in Chicago are black -- that old demographic, geographic and socio-economic side of the gun "problem" the media persistently hides. Amici insist it is crucial for minorities, including Women State Legislators, Jews for the Preservation of Firearms Ownership, and the Pink Pistols specifically named in the opinion. And the lament that this would give judges a difficult task when questions arise, in an area where they lack expertise, well, the Court reiterates to Breyer that interest balancing is not acceptable, so the poor overworked judges don't have the problem. "In Heller, we held that the Second Amendment protects the right to possess a handgun in the home for the purpose of self-defense. Unless considerations of stare decisis [prior precedent] counsel otherwise, a provision of the Bill of Rights that protects a right that is fundamental from an American perspective applies equally to the Federal Government and the States... We therefore hold that the Due Process Clause of the Fourteenth Amendment incorporates the Second Amendment right recognized in Heller." "All the other amendments have reasonable restrictions on them. So I actually really like the Heller decision and the McDonald decision because they put the Second Amendment in the context of all the other amendments… people from the gun lobby like to promote the idea that you have an absolute or god-given right to possess a gun. That's clearly not true; your right can be restricted." "Every criminal defendant out there with a gun charge is going to raise this to try to get a better plea deal, so that's one issue. There aren't that many gun laws out there. There are only a few at the federal level, there aren't that many states that have done a lot, but the ones that are out there are going to be challenged... New York's registration and licensing scheme... California's assault weapon restrictions... the one-gun limit restrictions in the states that have those are all going to be challenged." "We'll publicly propose a new ordinance very soon... As a city we must continue to stand up and fight for a ban on assault weapons as well as a crackdown on gun shops and their owners, at the federal and state level... We'll also look for new ways to challenge gun manufacturers, including how they market to our younger people. We'll continue our efforts to close the gun shop (sic) loophole in Washington D.C... We are a country of laws not a nation of guns." "We are digesting the 200 pages and will have something tomorrow to stand up to the court's ruling," says Alderman Anthony Beale, chairman of Police and Fire Co. Committee on Chicago's City Council. The Chicago Tribune, writing the day before the decision, said: "Daley has discussed several options if the 1982 handgun ban is no longer in effect. Chicago could require firearm owners to purchase insurance and receive training or maintain a registry of how many guns are in particular homes so that police responding to an address will know what they're up against." Plus -- we've got the Armed Response series of self-defense DVDs, truly excellent, take a look, including a gun-fight simulator that plays on your TV! https://www.gunlaws.com/videos.htm. You wanna do something wonderful instead of watching TV? 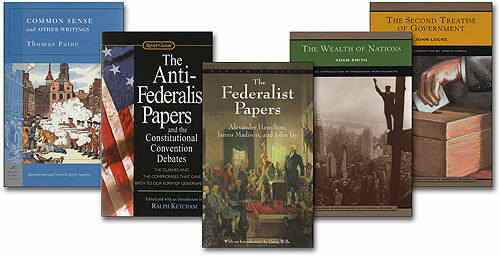 Check out our unique Founders Package -- the set of books the Founding Fathers read and wrote!